Manali is the gateway town for onward travel to Ladakh but mostly and popular vacation destination for domestic tourists and backpackers, especially in the summertime to escape the heat of the Indian plains. It was the starting point of our cycling trip and we planned to get there as quickly as possible from Delhi where we did not want to linger. From the Delhi airport we would catch a taxi, with our bicycles still in boxes, to the long-distance bus station where we would board the overnight bus to Manali. This was our ambitious plan - by the time we landed in Delhi we'd have been awake for well over 24 hours and by the time we would reach Manali we'd have been awake for more than 48. This plan fell through when my paniers didn't arrive at the airport (we blamed this on our premature high-fiving upon seeing our bike boxes unharmed and waiting for us before the luggage turnstile had even started operating). The airport staff had no trouble locating the missing bags in the system: "two bicycle bags at Helsinki airport with hand written luggage tags and no onward connection information". The bags wouldn't be arriving until the next day's flight so we had no choice but to find a guesthouse and wait for our bags to be delivered. A taxi got us to the Tibetan Colony in the north of the city. 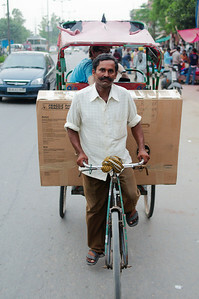 A rickshaw driver spotted us on the side of the highway near the entrance to the colony unloading our stuff and promptly loaded our bikes and luggage onto his bicycle. We led him through the narrow lanes of the colony finding the hotel where we had stayed two years earlier. The area had not changed much since our last visit, including our hotel which posted the exact same room rates. The next day, we got our bags at 4pm (after confirmation of arrival for 11:30am, 1pm and 3pm). We raced to the long-distance bus station hoping to leave the city that night. The bus station was in rough shape. We had remembered it as being hectic but it seriously looked like it had been bombed. 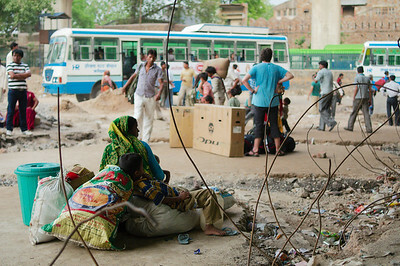 Most of the 30 some bus platforms had been ripped out and passengers navigated through rubble in an unusually (even for Delhi) disorganized way. After multiple enquiries we managed to secure two tickets to Manali on that evening's bus. We raced back to the hotel, found two rickshaw drivers willing to transport us along with our bike boxes and paniers and set off. The rickshaw drivers were brilliant! They navigated through rush-hour traffic (often riding against it). They even offered to add a considerable amount to the trip (for the same price) to get us to the front of the station when they realised how difficult it would be for us to get our things over the highway pedestrian overpass (we turned them down and instead raced across six lanes of traffic with a bike and our four heavy paniers). Yann actually carried all four of our paniers, we hung them around his neck with straps leaving his hands free for his bike. I managed to handle my bike, we drew many stares as we made our way through the huge station. Only one challenge left, finding our bus. With the station in ruins and no signs anywhere we had to rely on the hand-written P6 on our bus ticket to tell us where we would be finding catching the bus. Platform six was a pile of concrete debris with a constant stream of identical unidentified buses pulling up next to it. Yann spent the hour and a half leading up to departure showing our tickets to every single bus driver in the vicinity of platform six. Eventually, in the now darkness of the poorly lit station we identified our bus and loaded our bikes into the baggage compartment. We put up a small fight when we were asked to pay an additional fare for the transport of our bikes, but we were so happy to be on a bus to Manali that we agreed to the negotiated price of a "half-ticket". Seventeen hours, a broken drive shaft, a flat tire and a flooded baggage compartment later we were in Manali with all of our luggage and two soggy bike boxes. Manali is a really wonderful place to visit with friends and family, we can really enjoy our life some beautiful moments in this place, Great guide thanks for sharing this wonderful tour experience, cab service in agra we providing. Such a lovely post and pictures you captured in your travel trip. You shared great guide!! Thank you so much for sharing a nice post and experiences.